44 posts tagged with bayarea. You didn't really want to eat a home cooked meal, did you? SF is better than NYC. There. I said it. SF Bay Area Inaugural Meetup? Any MeFites want to get together on Tuesday the 20th in the SF bay area and celebrate the day together? Preferably near a media source? And beverages? Last-minute Mini-Meetup: Any Bay Area MeFites looking for something to do tomorrow (meaning Thanksgiving)? Me too! Movies or games or food or beer or all of the above are among my ideas. Whaddayasay? Who wants to do a post-Thanksgiving Bay Area meetup? Anyone running Bay to Breakers? P.S. it's loquacious' art show. woot! Psst! Bay Area Mefites! 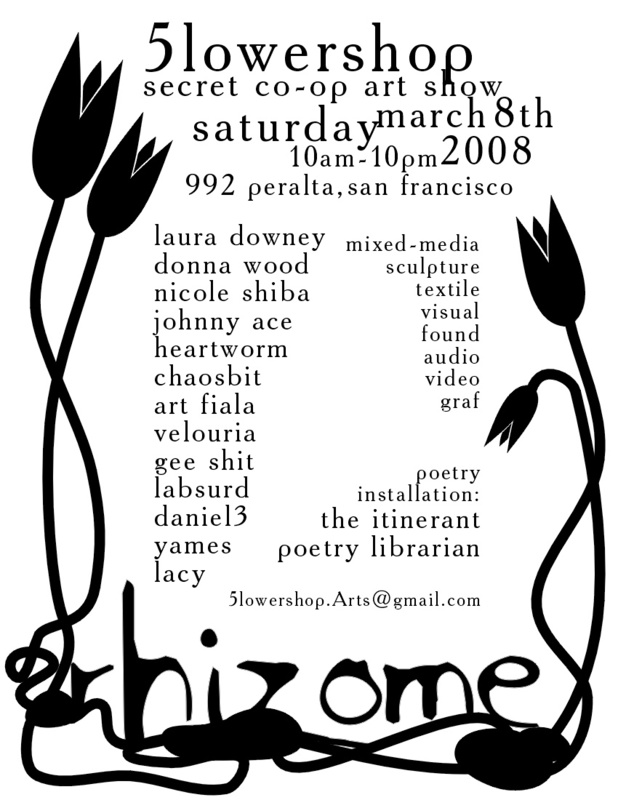 *tosses sheet over group, turns flashlight on to face, speaks in hushed tones* Meet up with me at this seeecret art show! Last minute Bay Area xmas meetup offer. Meeting my nephew for only the second time in his very young life, I will be in my hometown of Berkeley, California from Friday, July 27. Is there any interest in a Berkeley/Bay Area Meet-up? First round is on me! I suggest Triple Rock Cafe on Shattuck and Hearst on Saturday evening, but other thoughts duly welcomed. Ladies! Gentlemen! Children of all ages! MetaParent Bay Area Meetup? Inspired by this AskMe thread, would any MeFi parents in the Bay Area be interested in a family-friendly Meetup? It's the Peninsula/South Bay Meetup, Thank mathowie It's Friday edition!1one!! It's this week! The San Francisco meet-up, that is. Thursday, November 9, 2006, 7:30 p.m.-ish, Soluna Cafe & Lounge. McAllister Street (272 McAllister, to be exact), right near Civic Center BART. We'll be in and around the bar area. Reminder: MeetUp in two weeks (!!) in San Francisco. November 9, 2006, 7:30 p.m. on, at Soluna Cafe & Lounge. Right near Civic Center BART. Be there or be absent. I'd like to (help) organize an SF (California) meet up. Email me at ccenter@las-elc.org -- or comment away re preferences, past venues, etc. I won't be able to attend the Portland meetup because on 6/3 I'll be leaving for San Francisco where I'll be until 6/10. If anyone would like to do a meetup on that week, let's discuss. I'm in East Bay but pretty much willing to travel anywhere, as I need to explore more anyway. Bay Area meetup reminder: Saturday, February 18, Luka's TapRoom in Oakland. As announced on upcoming.org. Girls in glasses from Los Angeles will be gracing us with their presence, yo. Bay Area meetup: Saturday, February 18th at Luka's Taproom in Oakland. Three short blocks from the 19th street BART. 7 p.m. onwards. Special guest appearance by ach ooo tee hot. San Francisco Meetup, Sunday February 5, 7 p.m.. The boss and I will be in town to attend the Evans Data Developer Relations Conference, so we thought it might be fun to see some MeFites while in town. The gathering is at 21st Amendment (563 2nd Street), and we'll probably be the only table with an accordion. Hope to see you there! MeFiSF meetup! 7 PM til whenever on Tues, January 24, at Yancy's Saloon [ 734 Irving St, San Francisco, 94122; (415) 665-6551 ]. Beer, games, tons of nearby food, on the N line. Email me to get on the reminder list, or get reminders via the upcoming.org entry. Where's the (SF) Bay Area New Year's Eve MeFi party? Reminder: MeFiSF meet up Saturday, Oct. 22nd, 7:00 pm at Cafe Royal. We may not have Specklet, we may not have Naxos, but we will not be deterred from our chosen path. For we are resilient, and also thirsty. MeFiSF: Joy of the Big Apple meets Gem of the Tenderloin, this Saturday, October 22nd, at 7 PM. Track with Upcoming. Paging Naxos Axur: Tell us what day you would most like to see us, here in SF! (MeFites may join MeCha for Specklet, natcherly - see MeCha for details. East Bay meetup tonight at 7PM, location: Jupiter, on Shattuck! Wherein MeFi colleagues from the Bay Area share a friendly beverage and deface napkins and welcome squirrel back to the US / East Bay. Meetup in Berkeley! Tuesday! 9/20! 7PM! Jupiter! Now that scarabic has cut through our dithering and proposed a definitive date and time, I thought I'd repost that definitiveness, as the dithering is about to fall off the front page. Hey bay area, let's have a meetup! It's official! It's a Bendy Birthday! MeFiSF, Thurs, August 18th, 6 PM on, Zeitgeist. Upcoming.org has info and a reminder function. MeFiSF Meetup: Weds, May 25, 6 PM, Pauline's on Valencia. Swing by on the way home! Reminder: Hands Across the Bay MeFiSF meetup in Berkeley, starting at 5 PM at the Albatross (San Pablo and University), Sat, April 16th. More detail at upcoming.org. Attendees will receive a gift! The stars are in proper alignment for an East SF Bay meetup on Saturday, April 16, at 5 pm. The place: The Albatross in Berkeley (San Pablo and University). MeFiSF! Fri, Feb 11, 2005, 7:00 PM. Odeon Bar, 3223 Mission St (near Valencia). Email me if you want a reminder later this week. We can't promise $5 rebates, but we do welcome new members! Meetup reminder: Jupiter in Berkeley, 6pm onward, this Saturday the 29th. Bay Area Mefi/Mofi Meetup: Saturday, January 29 at Jupiter in Berkeley. Occasion: tracicle is visiting from New Zealand. That NY, taunting us with its rich meetup culture! For the less spontaneous, Meetup.com just suggested September 7, and scarabic and I put it on our calendars. Meetup.com also suggested (for SF) Jillian's, which is conveniently located at the Metreon (4th and Mission) but has little else to recommend it. In the past, scarabic has suggested other places, too. How about it? (7/13) at Zeitgeist. Meet on the deck in the back around 6-6:30pm.